Blue Rider Press, 9780399167195, 304pp. Williams, the award-winning songwriter, actor, and performer, has embraced a traditional alcoholism recovery plan for more than two decades of sobriety. Jackson, a well-known TV and film writer and veteran of many years of traditional therapy has never been a drunk or a drug abuser, but she realized that many of the tenets of Williams's program could apply to her. In Gratitude and Trust, Williams and Jackson ask: What happens to those who struggle with vexing problems yet are not full-blown addicts? Are there any lessons to be learned from the foundational and time-tested principles of the recovery movement? Whether you re tethered to your phone or you turn to food for comfort; whether you re a perfectionist and can t let things go or are too afraid to fail to even try; whether you can find intimacy only on the Internet or you ve been involved in a string of nasty relationships the first step toward feeling better about yourself and your life is the realization that you are what's standing in your way. Williams and Jackson have designed a new, positive program, based on a half-dozen new affirmations, that can help conquer your vices, address personal dysfunction, and start to brighten the darkest moods. Gratitude and Trust is an essential, inspirational, and uplifting guide to identifying and changing maladaptive behaviors in order to uncover your most productive, healthiest self. Paul Williams is an Oscar, Grammy, and Golden Globe winning Hall of Fame songwriter ("Rainbow Connection," "Evergreen," and "We've Only Just Begun") and President of the American Society of Composers, Authors and Publishers (ASCAP). He is a major public force in the recovery movement, a graduate of UCLA's Drug and Alcohol Counseling Certification Program and has served as a member of the National Council on Alcoholism and Drug Dependence Board of Directors. He was a founding board member and counselor for the Musicians Assistance Program (MAP), now the treatment wing of MusiCares. He has been a passionate public advocate for the recovery movement for the past twenty-four years. Tracey Jackson wrote the films Confessions of a Shopaholic, The Guru and The Other End of the Line among others. She has also written twelve TV pilots, and created the series BABES for Fox TV. Tracey wrote, directed, and starred in the controversial documentary Lucky Ducks, which can presently be seen on Amazon, Journeyman Docs and pay for view. Her first book, Between a Rock and Hot Place: Why Fifty is Not the New Thirty, came out in 2011 and was optioned for a TV movie by Lifetime. Tracey blogs three times a week on traceyjacksononline.com. She has blogged for Huffpo, WOWOWOW, Society for Drug Free America, Tiny Buddha and various other sites. 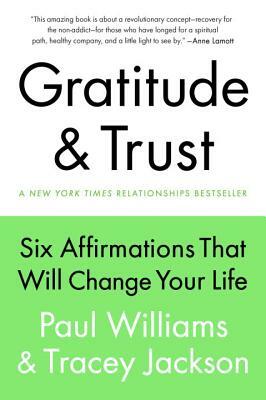 She runs Gratitudeandtrust.com with Paul Williams."